Wikileaks included the document in its dump of State Department diplomatic cables that it began releasing online in November 2010 and ended on September 1, 2011. Julian Assange’s arrest on April 11, 2018, sparked renewed interest in him and Wikileaks document dumps over the years. Arjun Walla published an article in Collective Evolution that discussed Assange’s arrest and examined the controversial Wikileaks’ Moon base document. Walla discussed it in relation to a host of Moon-related information that has been leaked over the years. This included a Congressional statement on building a permanent Moon base; CIA concern over Soviet plans to build a Moon base; Soviet concerns over the US plans to use the Moon as a military base of operations; and whistleblowers discussing photographic evidence of moon bases. I recommend reading Walla’s article for a succinct overview of this data. However, to explore the question of whether or not the USSR destroyed a secret Moon base in the 1970’s we need to go back a few years to the remarkable audio letters of Dr. Peter Beter. Beter was the General Counsel of the Export-Import Bank (1961-67) and had high-level sources who confided to him what was happening behind the scenes in space from the 1960s to the early 1980s. In this modern era of whistleblowers, it’s worth emphasizing that Beter was the first genuine insider to come forward with details about secret space programs. He described how the US and USSR were fiercely competing both in a race to the Moon and in the development of particle beam weapons that could operate between the Moon and Earth. It was clear that whoever first developed a particle beam weapon that could operate from the Moon would possess an overwhelming strategic advantage. By 1972, these experiments still were a long way from a suitable weapon for deployment on the moon. But ominous developments in the Soviet Union led to the decision to cut off the Apollo program prematurely so that the construction of the secret moon base could be rushed ahead. Early in 1973, soon after the supposed end of the American moon program, we began hearing about a place called Diego Garcia in the Indian Ocean. Supposedly we were merely building a communications installation there, yet the drastic step was taken of relocating all the 20,000 or so natives of this little island to other areas. More recently, we have heard about Diego Garcia as the site of a new American naval base; but, my friends, you still haven’t been told the whole story. Diego Garcia, my friends, is the new space-port from which secret missions to the moon have been launched during the building of the moon base. Unlike Cape Canaveral, where Saturn rocket launches are impossible to hide, Diego Garcia is remote and isolated, and even the natives are no longer there to watch what goes on. What’s more, Diego Garcia is practically the perfect moon-port, located as it is almost on the earth’s equator, and a space vehicle launched eastward into orbit from Diego Garcia passes over a nearly unbroken expanse of water for more than half the circumference of the earth. The only means of monitoring the early flight of a space craft launched from Diego Garcia, therefore, is from ships. I was first alerted to the existence of a secret base on the moon last November 1976–but it has been one of the best kept of all Rockefeller secrets, and it was only a few weeks ago that I was able to confirm its existence and learn the complete story; and since that time, events have moved with lightning speed. Throughout this year an unseen but deadly race has been underway to see who would get an operational Particle Beam first: the Rockefellers, at their secret moon base; or the Soviet Union, in earth orbit. By late spring, a Salyut manned space craft was launched that carried out preliminary tests of beam-weapon techniques, using lasers in order to simulate the Particle Beam. By the 26th of September, American personnel at the secret Rockefeller moon base nestled in Copernicus Crater were almost ready. Their Particle Beam was almost operational–but they were too late. By late that day, the Soviet Union began bombarding the moon base with a Neutron Particle Beam. Through the night, and all day on September 27 the moon base was bombarded without mercy with neutron radiation just like that produced by a neutron bomb; and by that evening as Americans looked up at the peaceful full moon overhead known as the Harvest Moon, the last few Americans on the moon were dying of neutron radiation. America had lost the Battle of the Harvest Moon. It’s not clear what the contents of the document titled “Report that UR Destroyed Secret US Base on Moon” discusses. Given its unclassified status, and the date it was created, the most plausible explanation is that it involved a discussion between Congressional and State Department officials about Beter’s “Harvest Moon Battle”, or some other unclassified material regarding destruction of a US Moon base and the development of particle beam weapons. Why would Congressional and State Department officials be interested in such information; and, more importantly, what did they have to say about it? A Freedom of Information Act request will help answer such questions. What follows are the key elements in Corey Goode’s two presentations at the Cosmic Waves seminar in Kealakekua, Hawaii on April 9 and 11. Goode made important predictions about how the disclosure process is going to play out, how to prepare for an imminent solar flash (aka micronova) event that would be in the range of an X-100 solar flare, and our entering an End Times era. It is helpful to make a record of such predictions in order to validate other aspects of Goode’s pioneering secret space program (SSP) testimony, which has had an impact far beyond the UFO and exopolitics communities. While many of the points Goode made have been stated before, there was new information that casts light on recent events, especially in his April 11 presentation. The first presentation was intended as a summary of Goode’s testimony and experiences. I will endeavor to cover the basic points Goode covered for those new to his SSP testimony, and offer a brief commentary on new information. Immediately prior to Goode’s April presentation, Elizabeth Wilcock (wife of researcher David Wilcock), made some surprising corroborations of Goode’s prior information on an inner Earth civilization called the Anshar. Using a shamanic communication method, she was able to meet and independently confirm the name of the sister of the Anshar Priestess Ka Aree that Goode has previously described as his chief liaison with the Anshar, and who had shown him possible timelines about Earth’s future. She pointed out that the Anshar Priestess was working with her to reintroduce the ideas of the “sacred warrior” and the “sacred feminine” into the mass consciousness, and that she teaches classes on how to achieve this. Wilcock also had a shamanic encounter with a group of Olmecs who had previously inhabited areas of South America, and mysteriously left, like the Mayans, centuries ago. She pointed out that the shamanic encounter happened the same day that Goode had his own experience with Mica, who has described himself as a descendant of the Olmecs who returned to their homeworld to eventually liberate it from Draconian Reptilian control. Previously, Goode has described other worlds controlled by Draconians, which go through a similar planetary liberation process where an individual plays a role similar to Enoch described in historic biblical texts, in mediating between conflicting sides in a planetary wide conflict involving extraterrestrials (aka Angels). Goode began his presentation by acknowledging the complementary nature of his and Wilcock’s information about the importance of re-balancing the divine feminine as an essential part of the ascension process. He pointed out that the blue spheres that he had initially interacted with and transported him to different off-planet locations, were not technologies but were actually higher density beings, that can morph into different shapes for any purpose. Goode described the beginning of his SSP service to when he was identified at the age of 6 as having the requisite genetic traits, and was enrolled in a special needs children program at his elementary school. He was subsequently exposed to an extensive training routine for children marked for SSP service over the next decade. At 16 years of age, during the Xmas school break, he was formally taken into the SSP service and had to sign draft papers even though it was illegal for minors to join a military service. Goode then switched to recent events and talked about the ambush and assassination at Lunar Operations Command (LOC) of Sigmund, who was his former military abductor from an SSP run by the USAF/DIA/NRO/NSA, who eventually joined the SSP alliance that Goode has been working with since early 2015. Sigmund had confirmed the veracity of Goode’s testimony and realized that the USAF SSP had been deceived by the Deep State about the existence of other SSPs and their more advanced technologies. Goode described how an electromagnetic bomb that would discharge a brief burst of deadly radiation, was placed in the ceiling of a room, and detonated when Sigmund and other meeting participants were killed without any structural damage to the LOC. Goode went on to mention that some high-level Earth Alliance sources, comprising senior officials, whom he was working with, had been introduced to David Wilcock, Jordan Sather and myself. I can confirm that I have met a senior military intelligence official from a NATO country whom Goode introduced me to, and upon whom I conducted due diligence. I was able to confirm his rank as a general, but have been asked not to reveal more about his identity. What I can confirm is that the general was convinced about the reality of Goode’s SSP information and was actively helping him gather intelligence information that would support his mission. Goode pointed out that the people who handed him two Defense Intelligence Reference Documents were able to print off the documents directly from the Defense Intelligence Agency database. This was a significant admission since it showed his contact still retains security clearances and access to highly classified government documents. The fact that Goode was the first to publicly release these documents is highly significant since it helps verify his status as a genuine insider who is being helped in his SSP disclosure efforts by DIA personnel. Goode pointed out that QAnon is an intelligence operation backed by the Earth Alliance (an assortment of White Hats from the world’s militaries). This suggests that at some point in the future, QAnon will elaborate upon previous posts referring to secret space programs and extraterrestrial life. Goode described similarities between his contact experiences and those described by Enoch – the pre-Flood patriarch. He pointed out that this kind of catastrophic event is something that happens at the end of every cycle. These cycles are described in the Law of One book series where a planet’s population has an opportunity to ascend after a 25,000 year period. In my recent book, Antarctica’s Hidden History, I explain some of the similarities between Goode and Enoch, and how these point to extraterrestrial civilization choosing to work with an individual during an End Times scenario as a witness and truth-teller of planetary events. He emphasized that full disclosure of SSPs and extraterrestrial life can’t be averted due to the disclosures that have happened so far with Goode’s and other people’s testimony. There are simply too many people who would ask questions about bases on Mars, extraterrestrial life, galactic slave trade, a Navy SSP, etc., for a limited disclosure scenario to work as it was originally envisaged by the Deep State. Goode asserted that even though he attempts to be as faithful to accuracy as possible when reporting about events and his contact experiences, his info is influenced by his personal perceptions and distortions. This echoes what the Law of One material says about the information transmitted by RA. He affirmed that Earth is a mixing point for a great variety of 3rd density souls who travel here for multiple purposes and missions. Incarnation on Earth is an accelerated opportunity for individual souls to ascend with the help of a planet, Earth, undergoing its own ascension process. Goode described the former super-Earth “Maldek”, whose remnants today make up the asteroid belt between Mars and Jupiter. He pointed out that a major part of Maldek’s destruction was solar activity associated with a solar flash/micronova. Goode emphasized that Earth has historically been a refugee planet for the inhabitants of former civilizations on Maldek and Mars who had to escape planet-wide catastrophes. He also affirmed that Earth has been a refugee planet for different extraterrestrial races over its history. The Olmec and the Mayans are examples of extraterrestrial civilizations that escaped to Earth to escape destruction or tyranny on their homeworlds, and eventually returned. He said that the Mayans spent thousands of years on Earth before returning to their home. All the Mayan pure-bloods returned back to their homeworld, and left behind those who were mixed-blood. This group is currently the native Mayan populations found in Central America. Goode’s information parallels the traditions of many indigenous peoples, including the native Hawaiians, who believe that they are descended from travelers from star systems such as the Pleiades, who visited, started a civilization, and then mysteriously left. Goode pointed out that there are approximately 60 human-like extraterrestrial groups that make up the Confederation of Planets, which has been directly interacting with humanity. The vast majority of these are multicultural in appearance, and only a minority are white. He met representatives of these different extraterrestrial groups when he served as an intuitive empath for SSP factions at Confederation meetings. He discussed the 22 genetic programs that have been run by the 60 human-like extraterrestrial groups. These have been run for approximately 500,000 years. Goode asserted that these are competing programs and that the extraterrestrials will sabotage rival programs by creating viruses, war, or other means to decimate a rival’s genetic program. The Confederation of Planets is a representative body that historically regulated the behaviors of the different extraterrestrial groups in conducting their programs. He emphasized that the genetic experiments were heavily compartmentalized by the social conditioning of the human population to stay apart from one another. Factors such as religious/spiritual belief systems, cultural practices, genetics, etc., were all used to maintain separation between the ethnic groups found around the planet. Goode elaborated on an earlier disclosure he had made that the Confederation of Planets comprising the 60 extraterrestrial races running the genetic experiments has been disbanded. After the next solar flash event, humanity will take on full responsibility for its own evolution. This suggested that despite widespread destruction, enough of humanity and its infrastructure would survive for us to take our place as a full member of the galactic community. Goode gave an outline of how the “partial disclosure” process will play out beginning with Space Force. The ultimate goal of Space Force is to roll out the existence of flying triangles, flying rectangles and stealth space stations that were covertly built and deployed by the MIC SSP. Some of these crafts have been photographed by one of my sources, JP, who has been encouraged to reveal these by USAF personnel. Space Force will allow the USAF to aggregate military technologies deployed in space under the one authority. Nevertheless, this will be a partial disclosure according to Goode since the Navy’s Solar Warden program would not be included. He affirmed that ruins of a civilization in Antarctica will be announced as part of the disclosure process. Eventually, these ruins will be connected to extraterrestrials who arrived on motherships that Goode has previously referred to as the Pre-Adamites. He pointed out that the 13 ruling bloodlines will make an effort to identify themselves as the genetic descendants of the extraterrestrial groups found in Antarctica. He believed that this connection is largely fictional and that the elites have been lied to about their genetic ancestry. Nevertheless, the global elite has accepted such lies since it sets them apart from the general population, and helps them justify their political and economic dominance. In addition, Goode said that the ruins of an ancient civilization buried underwater between Australia and Antarctica, and also between South America and Antarctica will be disclosed. These civilizations were formally located on islands, that were submerged by the last great flood, approximately 9600 BCE. Goode said that he saw some of the sonar images of the civilization found between South America and Antarctica. Advanced sonar on submarines was used to provide highly detailed images of the ruins that have been extensively examined by scientists. He said that a new whistleblower is being groomed for disclosures about ancient civilizations found in Grand Canyon. Goode described underground cities, and extraterrestrial artifacts that will substantiate Hopi and Zuni folklore. The whistleblower will discuss the discovery of extraterrestrial bodies that match what the Hopi/Zuni said about the Ant people. Goode summarized some of his previous disclosures about ruins found on Mars, which included pyramids. He affirmed the current existence of plant and animal life on Mars. Most importantly, he pointed out that SSP scientists had found remnants of a solar flash event on Mars. During Q & A, he elaborated on how SSP scientists learned about legends of a micronova destroying much of solar system on a cyclic basis. The SSP sent missions to confirm this and found it on Mars and the Moon. In order to prepare humanity for the shocking news that our sun has periodically generated enormous solar flash (micronova) events that have wiped out civilizations on different planets, it was arranged for NASA to send lunar missions to find “black glass”. This was the residue of an enormous plasma discharge that heavily impacted the Moon and Mars during an earlier solar flash event. Importantly, Goode stated that our collective consciousness can mitigate how the solar flash plays out. He emphasized that we have the power to influence reality around us by our thoughts. Therefore, our mass consciousness can influence the sun while it goes through the solar flash event that will happen in a relatively short period of time. In a subsequent personal discussion, he stated that the window for this happening is approximately 13 years, and it would occur during a solar minimum when the Sun’s heliosphere was weak enough for a solar flash to be triggered by incoming cosmic waves. The current solar cycle 24 is about to enter a solar minimum predicted to start around 2019/2020, and this window would end with the next solar minimum (starting solar cycle 26) around 2031/2032. He said that after the solar flash there will be a major consciousness event on the planet. A wall of electromagnetic plasma energy from the Sun will trigger ascension, which is the expansion of consciousness according to Goode. This will make it much easy for humanity to resolve age-old problems. This will be literally the start of the long-predicted thousand years of peace on Earth. He stated that this process happens on every planet going through an ascension event. Goode asserted that all technology will be destroyed by the solar flash in the timeline the Anshar showed him during a visit. In this timeline, the extraterrestrials show up en masse to help humanity. Many of those that die in the cataclysms caused by the solar flash will be recycled to other planets. He emphasized the importance of making preparations for the solar flash event, both physical and spiritual. Goode endorsed “prepper” recommendations to live in high mountainous areas, away from low lying ocean areas, and to have enough food and water to survive a collapse of the electrical grid. He concluded that the spiritual preparations were the most important and that this would directly impact how the solar flash event itself would play out. Goode’s second presentation at the Cosmic Waves seminar focused on information he has received about End Times prophesy, and what he was shown by a variety of extraterrestrials and secret space programs about possible cataclysmic events associated with the end of various historic cycles associated with the Earth and Sun. Goode began by first acknowledging David Wilcock and myself for supporting his secret space program disclosures despite pressure from peers and groups opposed to his ground breaking testimony. Wilcock in particular has been subjected much harassment and financial pressure to disassociate himself with Goode, but has refused all financial incentives to do so. In my own case, I have received much peer pressure to abandon Goode’s testimony and to accept a more limited SSP disclosure narrative by those advocating a science-based UFOlogy that excludes whistleblower testimony. Goode then launched into the main theme of his presentation concerning end times prophecy. He began by pointing out that his grandfather was a Nazarene Minister who elaborated upon the End Times, and many revelations that would occur during this period. Goode defined “apocalypse” a great revealing, which we can understand in modern terms as full disclosure. He pointed out that during a solar flash event that devastates a planetary civilization, it is allowed under cosmic law for extraterrestrials to openly reveal themselves and interact with the population. Goode referred to end times prophecy in Hindu, Buddhist, Muslim and Christian prophetic traditions that point to a massive solar event occurring during the end times. In addition, he referred to Hopi prophecy about the Blue Star (Kachina) that will herald a major cataclysmic event associated with the sun. NASA was created to research a massive solar event, according to Goode. Continuity of species was the carrot used to bring nations together in a joint scientific effort to study a possible solar flash/micronova event that could wipe out much of a planet’s population and infrastructure. Scientists are desperately trying to predict when the solar minimum begins and ends in order to better understand the window when a micronova is most likely going to happen. Goode referred to a geophysical pole shift having been recently detected on Mars. All major nations with indigenous space industries have pledged to commit a percentage of their GDPs to the multinational secret space program that Goode has previously described as the “Global Galactic League of Nations”. The movie 2012 was a soft disclosure initiative since it showed the multinational attempt to preserve the species by building massive arks, and how this was kept a secret from humanity. Trillions of dollars go every year into funding the multinational SSP to build similar massive ships, according to Goode. He explained that in other star systems there have been solar flash events that have impacted their planetary systems. Goode said that the giant electromagnetic filaments (aka Birkeland currents) that connect different stars in our Cosmic Web create a feedback loop, which is triggering other stars, including our sun, to experience solar flash events. The Electric Universe model is one that different SSPs have adopted as most accurate, and that concepts such as “dark matter” and “dark energy”, used to explain shortfalls within the Standard Model’s understanding of the mass of the universe, will be shortly disproved. SSP scientists understand that there is an energetic relationship between each star through giant electromagnetic filaments. The SSP’s uses this energetic relationship to travel throughout the galaxy. Goode asserted that the cosmic web comprising giant electromagnetic filaments between stars, has an important connection with human consciousness. Consciousness is linked in ways that are very similar to these electromagnetic filaments. He stated that we are being acclimated to the electric universe model to prepare humanity for new technologies that will be shortly introduced and future SSP disclosures. He predicted that cosmic rays will increasingly hit the Earth and cause major earthquakes. Super volcanoes such as Yellowstone are likely to be triggered by the cosmic waves that are pouring into our planet due to the current solar minimum and the weakening of the Earth’s magnetosphere. Goode cited the Adam and Eve document that was discussed in Ben Davidson’s Earth Catastrophe Cycle Series. Scientists state every 200,000 to 300,000 years, the Earth’s physical poles flip. The poles attempted to flip 40,000 years ago but this was unsuccessful. He said there was a pole shift about 11,000 years ago. This corresponds to the catastrophic end of Atlantis around 9600 BC. The Pre-Adamite civilization that Goode previously described as having landed in Antarctica around 55,000 years ago, and which subsequently established a highly advanced technological civilization with colonies all over the planet (Atlantis), experienced cataclysmic events prior to the one that destroyed Atlantis. He affirmed that we are overdue for this to happen again. He cited a 1986 scientific paper published by the Royal Astronomical Society, authored by Professor James Deardorff with the title “Possible Extraterrestrial Strategy for Earth”, as accurately illustrating how extraterrestrials have chosen to work with individual contactees as the optimal way to influence our planet’s evolution. The Galactic Super Wave theory, Goode explained, was first published by Paul LaViolette in 1983. Different SSP factions began looking at evidence of this in 1987, and sent expeditions to study the wall of energy approaching our solar system. Goode described how people on the science missions were affected by the incoming cosmic waves. People that were temperamentally relaxed became even more mellow and genial, while those temperamentally more tense would become aggressive and violent. This led to the idea of “End Times madness”, which is only going to increase according to Goode, as predicted in different religious and indigenous traditions. The different SSP’s know that our star system is entering into this region of the galaxy. He pointed out that there is a feedback between our sun, cosmic waves and other star systems linked through the cosmic web. Goode affirmed that giant Blue Spheres have been actively assisting in buffering the energy from these cosmic waves until very recently. They first appeared in the 1930s, and were buffering the solar energies at the time, which could have otherwise led to solar events that humanity would have been unprepared for. He believes that humanity would have self-destructed if the blue spheres had not buffered these solar and cosmic energies. The Mandela Effect, according to Goode, indicates that multiple times lines are converging in our present era. These different timelines were created by elites wanting to change the course of human history, but they are doomed to fail as time is elastic, he explained. Goode described what he was shown by the Anshar about an asteroid, or possible coronal mass ejection, hitting the earth’s atmosphere just prior to a polar shift, tsunamis, extreme winds, and global wild fires. Impact happens over the Pacific Ocean creating medium sized tsunami, which is a marker for what’s to come. He then witnessed stars coming out of the sky, which were in fact extraterrestrial spacecraft arriving to help the surface population. Extraterrestrials have been compelling the different SSPs to share their advanced technology with the rest of humanity to maximize the numbers that could survive the upcoming solar flash event. This helps explain why the USAF SSP has been increasingly allowing its antigravity craft to be photographed by private individuals. Goode then spent time on how humanity can prepare themselves for the solar flash and end times events. He said that we need to detox our bodies of metals so that we don’t react to increasing solar plasma pouring into our planet. Spontaneous combustion is very possible during a Solar flash due to the accumulation of different metals in our bodies. He recommended vegetables such as celery, cilantro, kale, etc. for detoxing our bodies. A vegetarian diet is also very helpful for detoxing and a more general cleansing. In addition, we need to clear our karma and traumas through forgiveness and much inner work. This is especially important for negative emotions which store in our bodies as mass that will react to heightened solar and cosmic radiation. He emphasized that the incoming cosmic energies will cause us to judge ourselves so it’s good to start practicing forgiveness. He discussed some additional ways we to become physically and mentally prepared for these solar events: stay out of fear; join mass meditations; and build off-grid communities. He mentioned high altitude mountainous regions such as Boulder, Colorado and the Ozark Mountain as good locations for surviving Earth changes. During the Q & A, Goode described how the Zulu-looking dwellers of a planet that practiced shamanism who were never conquered by the Draconians, were able to consciously collapse their physical bodies and utilize micro-wormholes in their bodies to travel anywhere. This was an example of individuals learning how to use their physical bodies as stargates, something which I discussed in detail during my first presentation. After the solar flash event, those that have sufficiently raised their consciousness and developed their abilities will be able to similarly used their physical bodies as stargates. In response to a question about QAnon, Goode said that he is receiving the same briefings that are going through the QAnon channel, and also being briefed about the Q Anon codes. As mentioned above, Goode is being advised by a group of military intelligence officials, one of whom is a general from a NATO country I met in 2017. QAnon is directly tied to President Trump, and the three generals that persuaded him to run for the Presidency. While the generals are retired, they still have strong ties with the military intelligence community. Goode said he has been involved with people directly tied to QAnon for a long time. On the recent arrest of Julian Assange and his likely extradition to the USA, Goode said Assange is going to have a hard time with dark actors inside the British justice system, before ending up in the US where he can trade his intelligence for a deal. It has long been rumored that Assange was given data from the Democratic National Committee (DNC) servers from Seth Rich, a former DNC employee, who was murdered. If true, it is very possible that Assange can leverage such information for a deal with U.S. prosecutors. The anonymous group Q (aka QAnon), which has strong ties to the Trump administration and U.S. military intelligence, claims that former Secretary of State, Hillary Clinton, orchestrated a pay-to-play scheme where classified information was uploaded to her private servers, which were deliberately left susceptible to hacking from foreign entities. Among these entities was China which used the classified material from Special Access Programs and Sensitive Compartmented Information found on the Clinton servers to learn about advanced technologies deployed by the U.S. military in space. There is documentary evidence that Clinton was granted access to classified information on space technologies, and this was a topic covered in her emails discussing a range of issues including a possible UFO disclosure initiative. According to the information provided by Q, Clinton’s ultimate goal was to sell classified information that would allow China to bridge the technological gap with a secret space program run by the U.S. Air Force, rather than genuinely disclosing the truth behind the UFO phenomenon. Q has posted multiple times on Clinton selling America’s technological secrets to China during the period between January 21, 2009 and February 1, 2013 when she was US Secretary of State, and had access to advanced technology secrets including spy satellites and other space assets. HOW DID HRC [Clinton] OBTAIN SAP (SPECIAL ACCESS PROGRAMS) ON HER PERSONAL SERVER(S)? ACCESS TO SAP/SCI IS RECORDED IN A LOCAL ACCESS REGISTER OR IN A COMPUTER DATABASE —- WHERE ARE THE RECORDS? IDEN OF ‘SPECIFIC’ SAP/SCI ON THE SERVER PROVIDES A TARGET (ROADMAP) TO REVIEW ACCESS LOGS TO THAT SPECIFIC PROGRAM? WHAT PROCESS AND/OR SEC CLEARANCE WOULD BE REQ TO WALK-AWAY [TERMINAL_CLEAR] W/ SAP/SCI MATERIAL ‘ELECTRONICALLY’? The link is to an article by The Hill debunking an August 28 tweet by President Donald Trump that China had hacked into Clinton’s private server. The point Q is making by linking to the article by The Hill, which Q regards as a prominent part of the fake news establishment, is to identify China as the “Foreign State” that had gained “access to the SAP/SCI material on the server”, just as Trump had tweeted. Does HRC care about you? Would she sell out America’s secrets and Uranium to China/Russia [Ex 1]? This will be made public [soon]. Basically, Q is revealing that Clinton’s scheme of selling advanced technology secrets through susceptible private servers was sanctioned by the Deep State, which was betraying the US national interest. To date, I have received two sworn declarations from one [intelligence community] element. 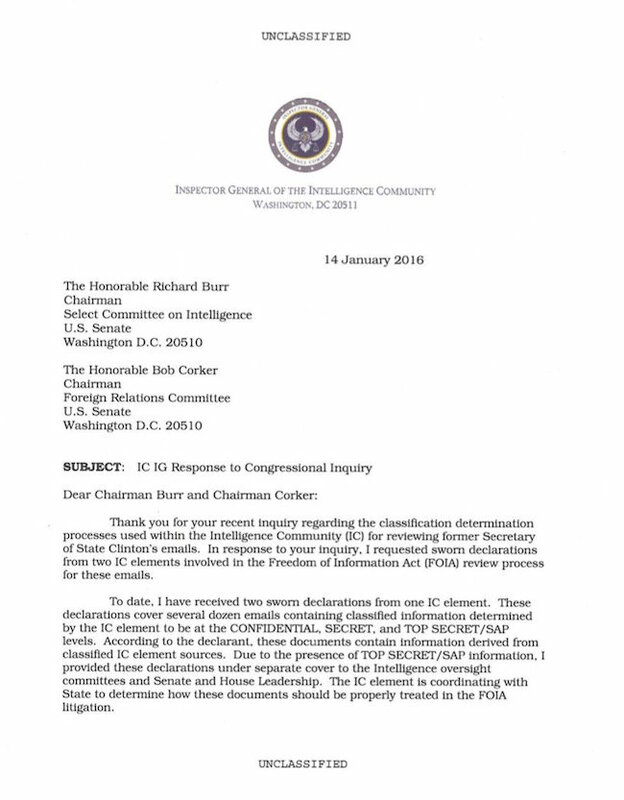 These declarations cover several dozen emails containing classified information determined by the IC element to be at the CONFIDENTIAL, SECRET, and TOP SECRET/SAP levels. According to the declarant, these documents contain information derived from classified IC element sources. Intelligence from a “special access program,” or SAP, is even more sensitive than that designated as “top secret” – as were two emails identified last summer in a random sample pulled from Clinton’s private server she used as secretary of state. Access to a SAP is restricted to those with a “need-to-know” because exposure of the intelligence would likely reveal the source, putting a method of intelligence collection — or a human asset — at risk. Currently, some 1,340 emails designated “classified” have been found on Clinton’s server, though the Democratic presidential candidate insists the information was not classified at the time. It’s worth emphasizing that the SAP information was found in only random sample of the Clinton emails, suggesting a great many more lay among the 1,340 classified emails that were sent and stored on the Clinton private server. Documents leaked by Wikileaks confirm that the Clinton and Podesta were doing more than simply making comments in support of declassifying UFO/UAP information. Podesta was involved in meetings discussing the testimony of Major General William McCasland and other insiders about their knowledge of the UFO topic, and strategizing over how the Clinton campaign could support a disclosure initiative to release this information to the US public. Given her historical interest in UFOs and publicly disclosing this information, it is all but certain that some of Clinton’s emails discussing the UFO topic were stored on her private server, and this encroached on SAP/SCI material concerning advanced space technologies. 2011 Shuttle Program terminated by Hussein [Obama]. Significantly, Q was referring to North Korea as a recipient of NASA’s technology secrets and mentioned Elon Musk’s Space X as playing a role. Presumably, the Deep State was helping North Korea develop its ballistic missile capabilities with the latest rocket technologies developed by NASA and, incredibly, Space X. To learn more about the kind of SAP information Clinton was including in her emails, we can turn to a Sensitive Compartmented Information [SCI] Nondisclosure Agreement she signed on January 12, 2009, which outlined her legal responsibilities. Importantly, her Nondisclosure Agreement reveals four SCI control systems (which cover material from multiple SAP’s) she would have access to. Put simply, Talent Keyhole is surveillance data gained from America’s most highly classified space platforms, which allegedly only involves data from spy satellites the U.S. Air Force and its partners in the military intelligence community (National Reconnaissance Office, National Security Agency and Defense Intelligence Agency) has sent into space. Q was here acknowledging that secret space programs are real and the information is classified at a very high level “outside of public domain”. This refers to Special Access Programs that are associated with the Talent Keyhole control system that Clinton was granted “need to know” access to. According to my research into secret space programs, the USAF has deployed manned space stations, along with orbital weapons platforms incorporating destructive technologies such as “Rods of Gods” and “Directed Energy Weapons”. These are all part of a USAF run secret space program, which operates advanced antigravity craft from sensitive facilities such as Nevada’s Area 51, the Utah Test and Training Range, Kirtland Air Force Base in New Mexico, and Florida’s McDill Air Force Base, home of Special Operations Command. In late 2017, different shaped antigravity platforms such as flying triangles, rectangles and cylindrical craft were photographed near McDill AFB in a disclosure initiative being conducted by USAF Special Operations, which encouraged a local resident to take the photos for public dissemination. The conclusion that can be drawn from Q’s posts is that included among the SAP/SCI material that Clinton was storing on her servers, was Talent Keyhole level information about the surveillance capabilities of the USAF run secret space program. This highly sensitive information appears to have been sold off in an illicit intelligence market to major U.S. rivals such as China and North Korea with the support of the Deep State and the CIA. It is possible that Clinton’s interest in UFO disclosure, was used as a cover to discuss Talent Keyhole material in emails that would be saved on her private servers, and eventually accessed by Chinese and other foreign hackers. From the documents and evidence that has been made public so far, it is clear that Clinton had SAP/SCI material on her private servers, and this included Talent Keyhole level material which she had been granted “need to know” access. This makes Q’s claims that Clinton was selling off America’s advanced technology secrets to China and North Korea very plausible. Consequently, the possibility that Clinton was part of a Deep State/CIA plan to funnel technological secrets, including information about a USAF run secret space program, to China, North Korea and other foreign entities, demands a serious investigation. Indeed, some of the more than 80,000 sealed cases that have been identified in PACER judicial records, may involve charges of treason against Deep State officials involved in selling off America’s advanced technology secrets. It can be hoped that as more information is released in anticipated criminal/military trials that Q contends are imminent, that these provide the opportunity for official disclosure of a USAF secret space program, and the release of advanced technologies that would greatly benefit the general public. On February 20, 2019, David Icke was banned from entering Australia to start a five city speaking tour. His banning occurred fours hours before his departure from Los Angeles to Melbourne, despite being previously granted a visa in September 2018. He has previously visited Australia 10 times to give lecture tours where he has spoken about a range of geopolitical topics, including the role of Reptilian entities in controlling the planet. As an Australian citizen, I wish to express my strong opposition to this banning and hope Icke succeeds in having the ban overturned ASAP. The following video statement has been created to support Icke’s freedom of speech rights and outrage over what the Australian Government has done.